Perception is defined as: the way you think about or understand someone or something. 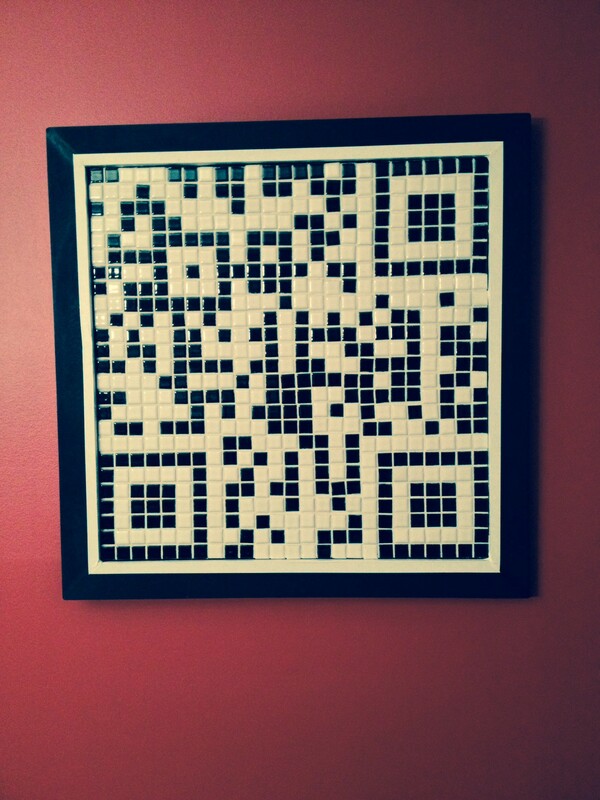 The mosaic pictured is a QR code for this art therapy blog. A few years ago, this mosaic might have just looked like a replica of an ancient one found in an excavated Roman ruin. You might be standing in front of this mosaic at an art gallery, and have found your way to this post via your QR code scanner on your smart phone. This QR technology allows this mosaic to no longer be just a mosaic, but an interactive, fluid art piece that will constantly change, yet remain the same. Your knowledge of the technology needed to interact with this piece of art makes all the difference, thus altering your perception of its layers of meaning. QR codes, or “Quick Response” codes have quickly crept into our lives as yet another means to access information. Really, they can be observed as a metaphor for rapid access into another world. In their simplicity, they can reveal something far beyond what can be understood at the surface level. Using this metaphor of QR codes and smart phone technology, is there anyone in your life whom you are misreading or not comprehending? Can you go back through your day and think of any encounters with others that you would like to revisit? Perhaps you judged someone only superficially? Can you imagine how different your interaction might be if you had QR technology to access parts of their psychic apparatus? Would you see them differently and at a deeper level? Would you have been more; patient, kind, loving, forgiving etc? When we really open our eyes and hearts to those around us, it becomes clear that we all have natural “QR technology” to genuinely perceive the world around us. This is the beauty of perception. Art therapists spend years training to hone their skills of perception, to truly understand their clients and their clients’ artwork. In a clinical setting, traditional talk therapy can move slowly based on the defenses we have built up though language. When art making is introduced, tremendous insight can be gained quickly. Art making, as neuroscience is confirming, can serve as a fantastic partner when exploring issues that have been buried for years in one’s subconscious. The goal is to blend art making, memories, and feelings to assist individuals in growth and healing from their wounded identities.